Moe Roddy is a retired RN and transplant to the Bay Area from St. John USVI and Newport RI. She has sailed and raced extensively in the Caribbean and North East both ocean racing and deliveries. 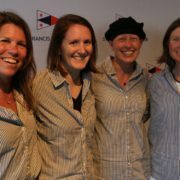 In 2005, at the age of 51, she became the second woman to finish the single handed leg of the Bermuda 1,2 ( the first having finished the day before her) and on the return leg to Newport her crew member was another woman, together they became the first women’s team to compete and finish both legs of the Bermuda 1,2. A record they still hold. She has spoken around the country about heart disease and women and uses her experience of both being a nurse, assisting in open heart surgery, and single handing to Bermuda to educate women about heart disease and empowering them to take control of their health. As she likes to say, “Sailing empowers women to do the things they thought impossible”. Moe recently retired after 34 years of nursing. 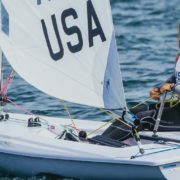 She is now actively involved as a volunteer at the Guide Dogs for the Blind, racing on Lulu with her partner and race management at both StFYC and SFYC.